As beautiful as the Huachuca mountains, the story of Jo as she recalls her life in the southwest, reverberates with history. In Huachuca Woman Author Arletta Dawdy weaves words into a beautiful tapestry of southwestern visions and feelings while the reader follows Jo on her poetic like journeys through varied eras in the American southwest. The author’s exquisite use of southwestern vernacular helps the reader feel just how the people of the era talked. The voices in this western historical fiction feel authentic. This is a must read for anyone wanting to know more about the strength of women. 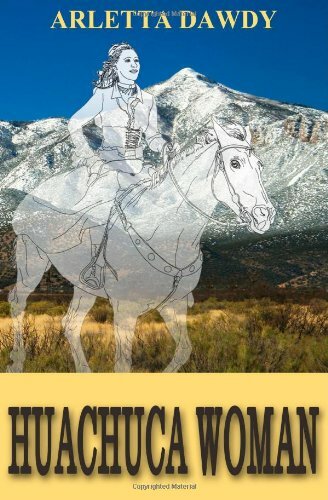 Huachuca Woman is available in paperback or as an ebook. I hope you enjoy it as much as I did. This entry was posted in authors, California Writers Club, poets, reading, Writers and tagged books, reading, Southwest, stories, writers. Bookmark the permalink. What a New Year’s present you are giving me by featuring HUACHUCA WOMAN on your blog. Your review is lovely and I appreciate your kind words and attention. For tempted readers, you will find price reductions for Kindle and the paperback versions! You’re welcome, Arletta! I look forward to reading your third book in the series about the women of the American Southwest.